The Harry E. Foster Charitable Foundation was established in Ontario in 1954 by the late Harry “Red” Foster and other private funding sources. 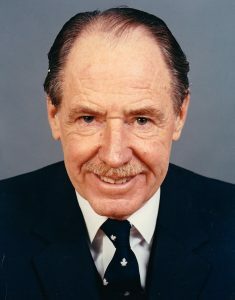 Harry “Red” Foster grew up in the family home on Oaklands Avenue in Toronto with his blind and developmentally disabled brother John (“Jackie”) during a time when people with developmental disabilities were closeted away from public view. Rather than send “Jackie” to an institution, the Fosters enveloped their most vulnerable member with love and a sense of inclusion in everyday affairs. Jackie’s “specialness” and the segregation experienced by him and those with similar disabilities was not lost on his older brother. Red decided to become actively involved in creating awareness of the contributions those with developmental disabilities could make if given the opportunity. Mr. Foster established the Foundation in 1954 to help support the various organizations being formed on behalf of people with developmental disabilities. Grants are largely made to charitable organizations in Ontario whose programs or projects fall within The Foster Foundation’s areas of interest. Grants are not normally made for operating funds, personnel or to individuals. Grants range from approximately $2,000 to $30,000, many on a matching grant basis. An outright gift of cash or cheque and a charitable donation tax receipt will be issued. A deferred donation such as a Bequest made through your will would result in a tax deduction on your estate’s final income tax return. If you designate The H.E. Foster Foundation as owner and beneficiary of a new Life Insurance policy, you will receive tax receipts for the premiums on that policy. Paid up life insurance policies which name The H.E. Foster Foundation as beneficiary will result in tax benefits. An Annuity or Charitable Remainder Trust, a special fund, is held in trust for your lifetime and you receive the income generated by it. The Harry E. Foster Foundation would be designated beneficiary of the capital. Please note: We are a small foundation and do not provide an annual report or brochures.